Samsung released a statement earlier today to remind all Galaxy Note 7 fans that the phone would be back in the hands of carriers on September 21 for those who had previously purchased the device and were looking to exchange their original Note 7 for a safe one after the battery recall took place. What they didn’t tell us was when we could expect to be able to buy one again. 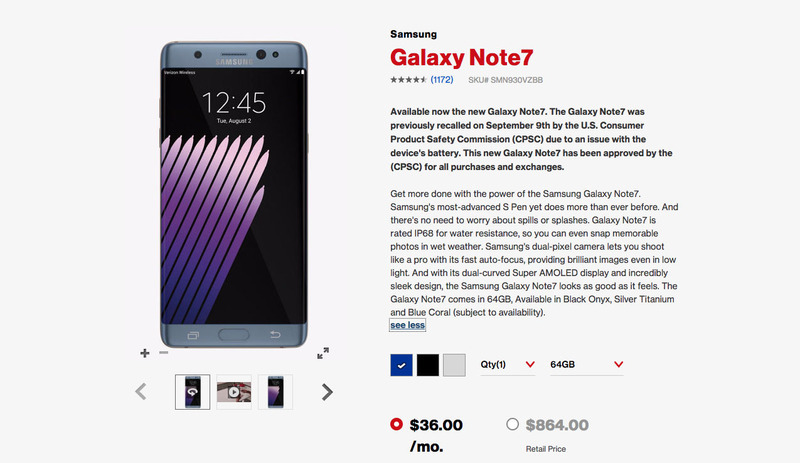 Previous rumors suggested the Galaxy Note 7 would not go back up for sale until late October, but Verizon appears to be selling the phone again right now. If you take a moment to cruise over to Verizon’s site, you’ll notice that they have all three colors (black, blue, and silver) in stock with no mention of a shipping delay. I even added each color to cart and attempted to checkout just to make sure that there weren’t shipping delays or notices about the phone shipping at a later date. All I foun was pickup availability the next day and a variety of shipping options that included having the phone arrive as early as Thursday morning. So yeah, if you want a Galaxy Note 7 that won’t explode and are a Verizon customer, order away! UPDATE: Sprint is as well!